As the last of the evening light faded into darkness, the humongous buck fed nonchalantly in a small patch of standing soybeans. His rack had a huge main frame with 11 points, several kickers and a drop tine. A dozen does and two smaller bucks were in the field feeding with him. The farmer had planted the beans way back in a tight little corner before buying a new combine that was just too big to work the tight space, and so a quarter-acre of beans had not been picked. We leased hunting rights to the property, and one of my guides had reported seeing the same buck in the same field two evenings before. He had been adamant about moving one of his hunters into shooting position. But over the years, I’ve learned to exercise a bit more caution with trophy bucks, especially early in the season. Typically, these older deer are wary, and you may only get one shot. So don’t jump the gun. Pattern the deer first and then set up that shot. The following morning, my son-in-law Mike took another client to a blind at the upper end of the same field and then spent the morning glassing that lower back corner. He saw several bucks in the secluded cul-de-sac, including a 140-class. He returned that evening, and a nice 150-class buck showed up with does. Then, just before dark, the big boy appeared, and Mike estimated his rack at 180 inches. While Mike was watching the deer, his client took a different buck at the upper end of the field, about 1/2-mile away. Mike said that when the muzzleloader thundered, the deer in the corner didn’t do more than raise their heads and look around before continuing to munch beans. Being able to hunt deer that haven’t been pressured by other hunters is one of the main advantages of the early season. The following morning, I went to the field and glassed the pocket, figuring if I saw the buck it was time to put a hunter on him. Once again, the buck failed to make a morning appearance but that evening was the first one in the plot—a good hour before the end of legal shooting. The following day, after the morning hunt, Mike and I moved a small portable blind from the upper end of the field into position 100 yards below and on the downwind side of the hidden corner. The one-man Darkwoods blind is great for such tactics, as it can be hauled in and set up in minutes with virtually no noise or disturbance. I believe these tight little blinds also inhibit human scent dispersal, and as a further precaution, I may put a smoking scent stick in each open window and spray the net window covering with scent killer. The following morning, I drove a client right to the blind. There were deer in the corner when we drove up, and they spooked out. But the hunter told me deer were filtering back into the field 10 minutes after I drove away. I am a firm believer in driving right to the blind or tree stand, wherever possible. 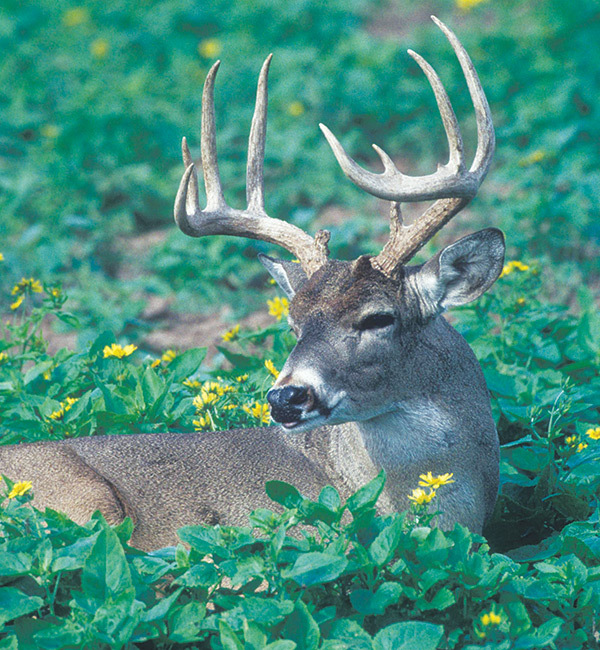 Most whitetails, especially in farm country, get used to vehicles in the form of tractors and trucks and don’t get too excited by their approach, especially early in the season. But let a wary whitetail buck catch a hunter sneaking through the woods and also leaving a scent trail, and that buck may depart the area altogether. We try to drive the same routes every time through, whether using a pickup truck or ATV to take clients to the stands. When hunting by myself, I may just drive right to the stand on a four-wheeler, unload the gear and then drive to somewhere close by where I can park in brush and cover the little vehicle with camo netting. Then I spray it liberally with scent killer and hike the short distance back to the stand. Many a time, while on stand hunting, I have watched deer walk within a few yards of the parked machine without showing more than passing concern. As I drove this hunter in, I advised him to hold off on anything smaller than the trophy buck. But he didn’t profess to be a trophy hunter and took the first decent eight-point that entered the field. We quickly loaded the deer and got out of the area with as little fuss as possible. After three more days of watching the big buck come back out each evening, I figured that shot hadn’t spooked him and there was a good chance he might show up the following evening. All of the other hunters in camp had either filled their tags or seen good bucks and didn’t want to change location. I almost had to beg a first-time deer hunter to take the stand that afternoon. I dropped him off at 2 o’clock, and he later told me that within half an hour, does and small bucks were moving in out of the timber to feed. When the big buck he was waiting for made his predictable appearance that evening, a single well-placed shot put him down. In my estimation, early season whitetail hunters spend too much time hunting and not enough time scouting. In most states, bucks are not yet in the rut and mainly interested in filling their bellies, and they are without doubt as easy to pattern as they will be at any point in the season. Naturally, the best locations to scout include feeding and watering areas and the travel routes leading to and from such places. Patience is the watchword. I want to see that buck more than once or twice before choosing an ambush location, and I usually figure the third time is a charm. Several years back, I was hunting during Alberta’s early archery season with outfitter Harvey McNalley. He was with clients, so I spent the first couple of evenings scouting with his wife, who also knew the area well. The first evening, we watched several really good bucks move out of the brush into alfalfa fields to feed. I hunted the next two mornings but was back at the alfalfa fields each evening, observing the bucks. Four does and two bucks, both over 150 inches, moved into the same field from the same corner all three evenings. Harvey wanted to put me back in the brush some 100 yards from the field, in the only aspen large enough to support a tree stand. However, I convinced him to instead dig a pit blind at the edge of the field, maybe 75 yards from the deer’s entry corner to the field. 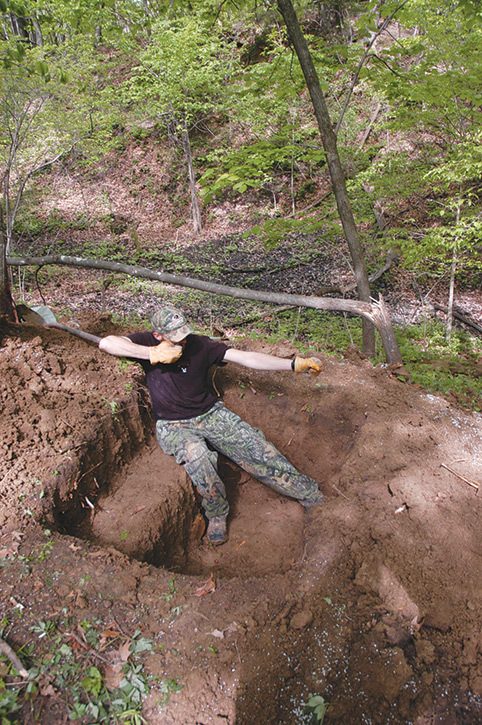 While I hunted the next morning, Harv and his wife dug the pit blind, and that evening, I arrowed a 157-inch buck out of the pit. Later that week, Harv and I located a bachelor group of bucks moving out of a vast section of bush country to feed on the oats in several of those large, round hay bales. When the rancher told us he was going to pick up the bales the next day, Harv bought a couple and asked him to leave them be. Then we spent half a day building a look-alike blind and setting it slightly downwind and maybe 20 yards from the real thing. That evening, Harv’s hunter arrowed a 160-inch buck from the fake bale blind. Once again, a couple of days of scouting and formulating a good plan of attack resulted in a trophy buck on the first day of actual hunting. Most hunters only have so much time and would much rather spend it with bow or gun in hand. Yet there is little doubt that patterning is the key to consistently tagging mature bucks early in the season. For several weeks prior to the opener, I and my guides are out every morning and evening with binoculars and spotting scopes, trying to get a firm handle on deer movement on our leases. The closer to the season opening, the more intense that scouting gets. Every fall, we pattern a trophy buck or two in a new area or using an unexpected travelway, and once we get a firm handle on the situation, we figure an ambush plan for that deer. We give full consideration to the location and the likely wind direction and then choose a ladder stand, a pop-up portable blind, dig a pit blind, or just settle on a spot back in the brush. We do all of this with as little fuss and disturbance as possible. A couple of years back, I spent the three days prior to first firearms season on the same hillside glassing long, narrow necks of a harvested cornfield, trying to get a handle on when deer fed in the fields, crossed to a creek bottom or to the staging and bedding areas on the cedar ridges above. All three mornings, I glassed a heavy-antlered buck with several does and smaller bucks moving from the creek bottom, across the field and into the timber. He crossed within 100 yards of a large cottonwood with a pile of dead limbs and brush around its base. Opening morning, after determining the wind was right, I drove a client to the tree in predawn darkness and situated him in front of the tree trunk in the brush on a low turkey stool with a sturdy tripod for a shooting rest. The hunter reported an unobstructed view for 300 yards on either side. That’s how every outfitter would like to see every hunt end, and if you put in the time scouting on your own and formulating a solid plan of attack, you may enjoy the same kind of early season hunt.